Below you will find a list of discussions in the Galaxy Nexus Apps forums at the Galaxy Nexus Forum - Samsung Galaxy Nexus Community. 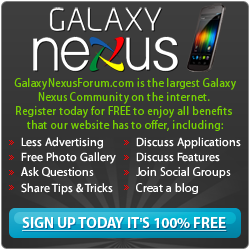 The Galaxy Nexus Apps forum is for discussion of: Discussion about the various apps that run on the Galaxy Nexus belong in here. (Samsung Galaxy Nexus Applications). Sticky: !!! Please Read Before Posting an App !!! How to recover messages from samsung j7? How to recover lost messages from samsung note 9? How to recover contacts from samsung galaxy s5? How to recover deleted photos from samsung a3? How to Transfer Photos from Samsung to Xiaomi Mi Mix 3? How to Recover Deleted Data from Huawei Honor Play? How to Recover Deleted Photos from Samsung Galaxy S6/S6+? How to Recover Deleted SMS from Samsung Galaxy Note 5? How to Recover Deleted and Lost Photos from Samsung Galaxy A5? How to Recover Deleted SMS from OPPO F3/F3 Plus? How to Transfer Photos from Samsung to Xiaomi Mi 8 SE? How to Transfer Date from Android to Samsung Galaxy A8/A8+?